Help requested for an article on former SANFL Club Sponsors. I am looking to put together an article to submit to the "Adelaide Remember When" page on Facebook about old or former companies or businesses that sponsored clubs in the SANFL in the 60's-70's-80's. I am trying to put together a list of some of the names that I can recall and would love others to add to the list or to help me fill in the blanks. Here is a small grouping of what I have put together so far. Norwood - AGC Finance (I think they are now GE Money). South Adelaide - Hardy's Wines, Patawolonga Motor Inn, Dario Caravans. West Adelaide - I can't recall the name, but they made and sold BBQ's on South Rd? West Torrens - A company that sounded something like 'Reymel" - I think they did either plastics or sheds? All - Golden Fleece - Mobil for car sticker promotions. Re: Help requested for an article on former SANFL Club Sponsors. 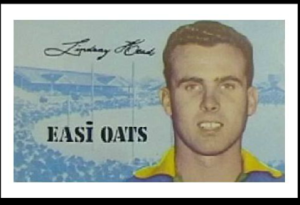 I can just remember getting a player card in Easy oats back in the 60's. 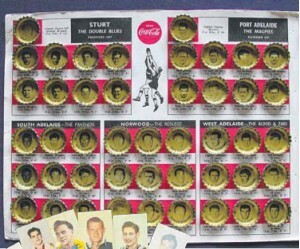 And pictures of players under Coke bottle tops. Also, it could have been Amscol or Peters ice cream that had different coloured ice cream between wafers. I can remember the Westies ice cream was grey and pink, Port was grey and white. Milestone Chemicals and Cappo Brothers Seafood at West. That took me back, firstblood, (a bit too suddenly, in fact). I think I have still got an Eddie Barlow (South African cricketer) bottle top somewhere....!! We need a bigger picture of the West Adelaide part of your bottle top pic.! RODH2 wrote: That took me back, firstblood, (a bit too suddenly, in fact). I think I have still got an Eddie Barlow (South African cricketer) bottle top somewhere....!! We need a bigger picture of the West Adelaide part of your bottle top pic.! North Adelaide in the 70s PHR Group of Companies and New Pink Pages at different times had their insignia on the Guernsey. Then in the 80s and much more prominently were Dunlop Flexible Foams (Dunlopillo), Adelaide Pest Control and then SES Crane Hire before Clipsal became the Major sponsor around 1988 and remained as such well into the 21st century. When Clipsal was sold overseas, another Gerard company, Mistral took over as major sponsor until a few years ago. Thankyou, robranisgod now that you mention it I recall Mistral being a sponsor and think they may have sponsored WWT also at one stage. I will look into the other names you have provided! Woodville were sponsored by Stewart Moffat Travel in the early 80's and from memory, Easybuilt just afterwards. Sturt had Sanctuary Cove from memory back in the 90s. Graeme Douglas Datsun in the 70s. House Bros Homes in the late 2000s. De Bortoli wines late 2000s. Associated Midland sponsored Glenelg during the 1980s. Standard Chartered Finance were the major sponsor of Port. C.K wrote: Woodville were sponsored by Stewart Moffat Travel in the early 80's and from memory, Easybuilt just afterwards. Port - Standard Chartered for many, many years. Probably one of our longest running sponsors with Maugham Thiem who have been long time sponsors too. Jetspress for a period, they may have been one of the first to be on our guernsey, early - mid 70's. Pagel Glass in the early 00's. Booney wrote: Port - Standard Chartered for many, many years. Probably one of our longest running sponsors with Maugham Thiem who have been long time sponsors too. didn't Port raffle their major sponsorship at one stage ? i'm almost certain that the Seaton Hotel was the first winner of the raffle, if my memory serves me correctly how many years did the raffle occur ? I'm fascinated by this subject also. It always surprises me that football clubs don't include major sponsors in their official records. It would be a lot easier for fans. I've been watching lots of old SANFL videos on Youtube recently, and have been trying to work out the club major sponsors. South definitely had Woodley (Wines & brandy) in '83-'84, but had a new one by '85 which I can't quite decipher, as I'm vision-impaired. It looks something like "Nylee". Torrens had Marshall Thompson Homes from '86-'90 & Woodville had Devon Homes from '86-'90. West had Banner Hardware as their major sponsor for a while, but it's hard to make out their earlier sponsors. Centrals had Elizabeth Town Centre in the 1970's (I think up until 1980 - definitely the first year or so of the Hicks era white guernsey). Parabanks also sponsored Centrals prior to Pye Audio. I have Poms to Premiers at home so when I get home I'll see if I can work out the dates from there. PS - awesome thread and look forward to seeing it on ARW. Woodville had JM Insurance for a while, Devon Homes was their last major sponsor. In case anyone's interested, further research has revealed that South Adelaide were sponsored by Wylie's Shock Absorbers in 1985, the same year that the W.H. Wylie & Co was bought out, so that the product became Monroe Shock Absorbers.